There’s hardly anything more thrilling than an environmentally friendly marriage between automotive design and architecture. 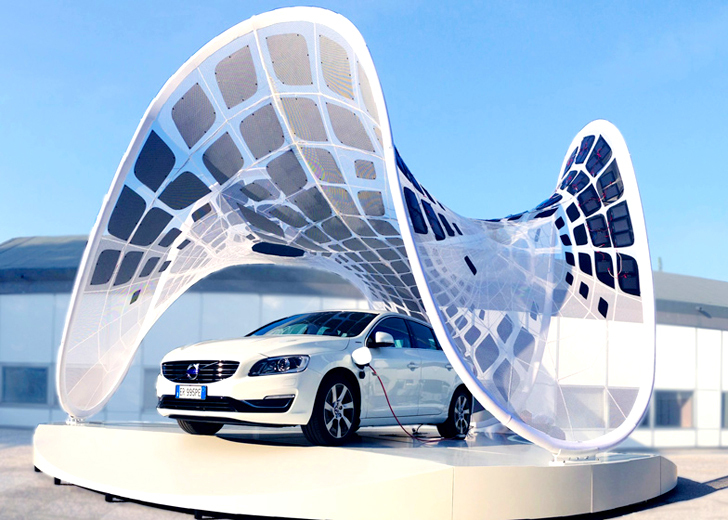 Los Angeles-based SDA has teamed up with Buro Happold and Fabric Images to create a portable, sun-powered charging station for Volvo’s new V60 Hybrid Electric Diesel car. The Pure Tension Pavilion is a tension membrane structure made of a carbon fiber ring and 252 photovoltaic panels embedded into its HDPE mesh skin. Unveiled in Rome, Italy in September 2013, the structure was developed as an attempt to reinvent a typical trade show pavilion. Its dynamic form and energy efficiency is reminiscent of Frei Otto’s experiments with lightweight tension membrane structures in his search for forms that would be both visually engaging and efficient. The tensioned HDPE mesh skin carries 252 flexible photovoltaic panels that provide enough power to charge Volvo’s new V60 Hybrid Electric Diesel car. The car plugs directly into the pavilion’s skin and charges using the energy collected daily. The excess energy is used for the pavilion’s artificial lighting. The carbon fiber tube ring is deformed into a shape that gently embraces the car and pushes out while the skin that binds it pushes in, creating a dynamic that is both physically and visually apparent. The structure is cost-effective, easy to disassemble and is light enough to be easily transported. Unveiled in Rome, Italy in September 2013, the structure was developed as an attempt to reinvent a typical trade show pavilion. Its dynamic form and energy efficiency is reminiscent of Frei Otto's experiments with lightweight tension membrane structures in his search for forms that would be both visually engaging and efficient. 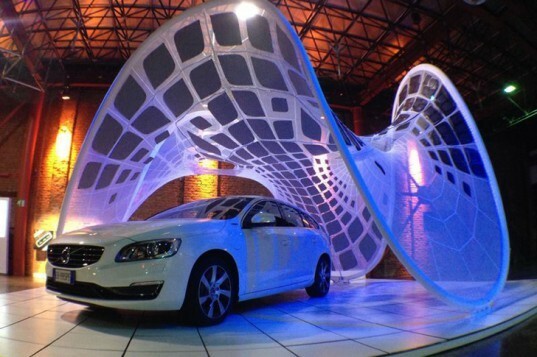 The tensioned HDPE mesh skin carries 252 flexible photovoltaic panels that provide enough power to charge Volvo’s new V60 Hybrid Electric Diesel car. The car plugs directly into the pavilion’s skin and charges using the energy collected daily. Excess energy is used for the pavilion’s artificial lighting. The carbon fiber tube ring is deformed into a shape that gently embraces the car and pushes out while the skin that binds it pushes in, creating a dynamic that is both physically and visually apparent.